If you’re anything like me, mornings are not your thing. If you’re one of those crazy people who loves early mornings and go to bed by 10pm every night, you won’t take much from this post so don’t read any further! I’ve always been much more of a ‘night owl’ for creative juices flowing – I work best under pressure. I always finished my school coursework at about 3am the morning it was due to be handed in. It’s been the same ever since. I usually go to bed quite late, set an alarm for an hour before I need to get up, then end up leaving myself 10minutes to get ready for work. Not a relaxing way to start the day! So the idea of finding an extra hour in the morning before work to commit to some extra tasks in my business made me twitch. But a couple of nights ago, I hit the wall at 9pm in front of my laptop. My eyes felt like someone had been rubbing them with sandpaper and I wasn’t getting anywhere trying to draft a blog. I figured it made sense to go to bed and get up early – and I knew it wasn’t going to be easy! WAKE UP YOUR BRAIN! 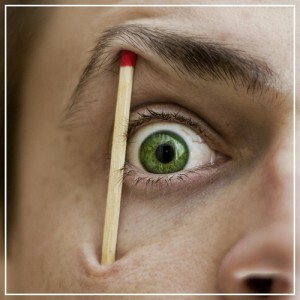 If you don’t do this as soon as your alarm clock goes off, your chances of waking up quickly are shot. This app is amazing! 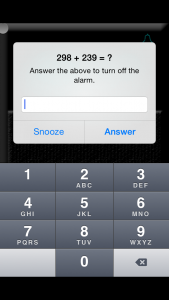 It makes you solve a maths puzzle in order to stop your alarm and it really works! 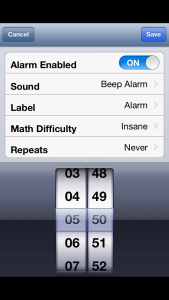 Choose an alarm tone – I suggest you choose something that utterly repulses you and makes you shudder. 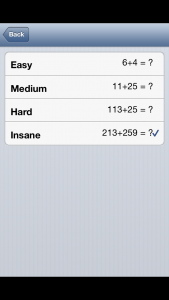 The following screen shots may make you think I’m crap at maths… I’m not – I chose ‘insane’ for a reason…! But doing this bleary eyed at 5.50am is not as simple as you may think. But it certainly wakes your brain up! I was up and at my desk with a coffee by 6am, got a long list ticked off before I went to work today and did not feel too horrendous at all! It obviously helps that I’m getting up for is earning me an extra income and growing every day in to something I am really excited about. But today’s post is merely a recommendation for a tool that you may find useful – whatever your life entails. If you’re trying to make time for something and with the best intentions, are simply not succeeding – try it. No excuses! ← Sunshine Makes You Happy!